This is another fabulous recipe from our friend Chris over at Lost Arts Kitchen. Chris is brilliant in the kitchen and a great teacher about food and food preparation if you are in the Portland OR area. There are many recipes on the Lost Arts Kitchen site that are GAPS or GAPS-friendly, but she now has a GAPS blog as well called Cooking GAPS. So here is Chris' recipe for lacto-fermented mayonnaise, which is now the only kind I make! Thanks for posting this. I'm going to try it. I added a link to Cooking GAPS on the right-hand side of our blog. I tried a similar recipe but didn't leave it out for 7 hrs. I'll have to try it. Sounds good. He says to use sunflower/safflower oil. Are those legal? I use olive oil. I've found that all brands that I've tried besides Bragg are too bitter, but the Bragg works well. Before I found the Bragg I tried sunflower (not ideal, and probably not GAPS-legal, but I think one of the best of the liquid oils). I also tried macadamia oil which was good but expensive. When I make this recipe I also use apple cider vinegar instead of lemon juice (I just prefer the taste), and kefir instead of whey (just easier). I think my GAPS book is loaned out at the moment, but I'm pretty sure Dr. Campbell-McBride didn't list any oils as "illegal" that *are* legal on SCD. Sunflower and safflower oils are both SCD-legal http://www.breakingtheviciouscycle.info/legal/legal_illegal_o-s.htm. The issue is more one of balance. I eat tons of animal fat, olive oil and Omega-3's, so I don't worry too much about a small amount of a less ideal oil. 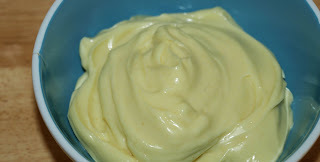 If one enjoys the flavor of an all olive oil mayo, then definitely do it, it's a great way to get more in. Sierra, I keep meaning to try the Braggs oil, but I haven't yet. Will try to remember next time I'm shopping. I think that even with the sunflower/safflower oil, this is a very healing food, so it's worth it, if it's the only way you or your kids will eat mayo. One can also try starting off with the oil blend as recommended and slowly changing the ratio, to gradually get used to the flavor of more olive oil.